A larger capacity vertical projector features a 20″ screen and permits mounting of a large stage. With improved image brightness and resolution, the V-20B delivers images with excellent clarity, while enabling observation in a comfortable posture. 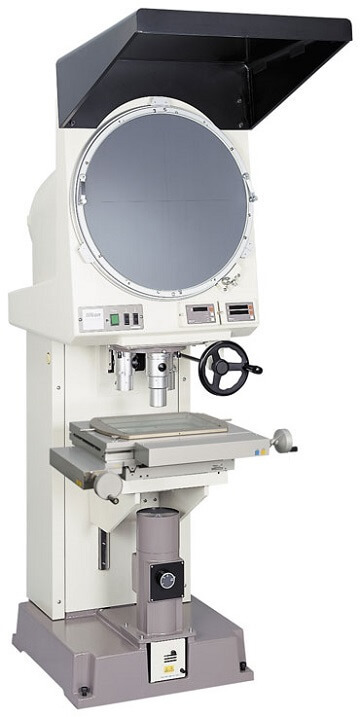 It features a large effective screen diameter of 500mm and includes a built-in digital counter and digital protractor. The V-20B comes standard with a built-in digital counter and protractor, making this one of Nikon’s most advanced comparators. Five types of projection lenses are available for the V-20B, 5x field of view 100mm, 10x field of view 50mm, 20x field of view 25mm, 50x field of view 10mm, 100x field of view 5mm. The stage up/down movement unit is rigidly built, and if the 10 x 6 stage is used, workpieces as heavy as 20kg can be loaded. The measurable range has been increased to 250 x 150 mm. All projection lenses have the same parfocal distance and feature long working distances. The built-in half mirror eliminates the need to adjust illumination each time the magnifcation is changed. With improved image brightness and resolution, the V-20B delivers images with excellent quality, while enabling observation in a comfortable posture by rectifying the eye-point height. The stage up/down focusing and the 10×6 stage are designed to handle the load of workpieces as heavy as 20kg while maintaining measuring accuracy tolerances.